Why won’t any of the really good wedding photographers just give me the files? As a Maine Wedding Photographer, I hear this question at least 2-3 times a week. People think all they need is to get the original files and it will be cheaper and easier. They’re wrong. Why? Most brides think that RAW simply means unedited, like a raw piece of meat is uncooked. That is only partially true in photography. RAW files contain multiple layers of data which pro photographers know how to adjust in expensive software programs that most consumers do not own or know how to use. RAW files are like digital negatives. Digital photography has revolutionized the industry. Back when photographers shot film they spent hours in darkrooms printing and reprinting from the negatives to get exactly the print results desired. Today they spend those hours in front of a color-calibrated, high resolution monitor. They bring out pictures that were a bit too dark, clone out fly away hairs, remove background distractions, darken highlights and lighten shadows. For example, compare the edited and unedited images below. Most brides simply cannot produce the same results as a professional photographer who processes thousands of exposures. If a photographer delivers 100+ gigabytes of RAW digital files to a bride on twenty DVDs or several USB sticks what happens next? Some will immediately be angry because they don’t have the software to even view RAW images. Some will download image conversion software that tosses out the majority of exposure information to compress RAW to JPG format. Next they will make adjustments to the JPG files on a screen that is not color calibrated. When everything looks good to their eye, on their screen, they will take the files to a consumer-level printer. That printer will apply its own color corrections and print out images on poor quality papers with discount inks that tend to fade quickly. Finally, the bride will put the images on social media and throw up a photo credit giving their wedding shooter the credit for what the image has become. That is a pro’s nightmare! For every hour a pro spends shooting at a wedding, most spend 3-5 hours processing and editing. With a second shooter on the team, they can get back to their office with 2,000-2,500 captures. After a weekend wedding it is not uncommon to spend the bulk of the next week editing them. The bride who has the skills and equipment to consider editing usually cannot afford to spend the time required. Most professional wedding photographers can recount stories of brides who have approached them years after their wedding asking them if they can do something with their wedding photos they have only on USB sticks. When choosing your photographer you view edited images either online or printed in albums. Their work will look strong and impressive. When you ask them for their RAW files it is like telling a great painter that you will finish the painting they started and walk out with their canvas. Your unedited image files will not compare to the images you saw when you decided to hire them and you will be disappointed. Your final images, even after your attempts at editing, will still fall well short. If you go with a wedding photographer who only delivers edited, high resolution JPG files, it will be up to you to do something with them. The reality is that most brides who go this route never do anything with their images beyond posting some on Facebook. Despite the best intentions, money and time keep them from having wall art printed or even the most basic books made, not the custom-designed albums of professionals, made. USB sticks get thrown into boxes and lost, computers crash and get replaced and today’s computer equipment grows obsolete. The bride who hires a professional wedding photographer who provides color-balanced, quality wall art prints or canvases and custom-designed albums, gives herself and future generations easy access to her wedding memories. Top photographers care too much about their art and the families they work with to give cut-rate services. They can’t bring themselves to offer shoot, dump and run services of delivering only digital files even though that’s the trend for others. Their images are their babies and they care what happens to them. Before you use your wedding photography budget to be the area where you try to make the biggest cuts, consider the long-term results of your decision and what you are sacrificing. Your love for one another and the printed photos will be the only things that remain years later. Scott Linscott is the owner and main photographer at Linscott Photography and Maine Pro Photo. He and his wife Robin work as a team as Maine Wedding Photographers and also serve as destination wedding photographers. Linscott Photography provides custom-designed, Signature albums featuring layflat spreads. I’m a fan of social media. I love the exchange of information and ideas. Pinterest is huge with brides. Some spend hours culling through thousands of wedding images and then, being excited, they send the images they love on to their photographer with a note or email of shots they “must have.” Ugh. Here’s the question. Do you want to live your own life or copy others? I mean, do you want your own memories of your day or are you looking to recreate the “best of” shots you find online? Robin and I would love the opportunity to photograph your wedding. We are loving life and enjoy the fact that our photography talents open doors for us to take part in so many of life’s celebrations. We specialize in wedding and portrait photography throughout Maine and the rest of New England but have also shot weddings in Florida, Ohio, Indiana and Hawaii. We are incredibly blessed to do what we do. We were married in 1984 and are still best friends. We love to travel together, explore, cycle back roads and learn new things. We are blessed with three grown children and are just now entering the grandparent stage of life. In 2012 all of what we had was threatened as disease devoured my liver. Thankfully, my oldest son gave me 60% of his liver in a transplant that saved my life. Now, both Robin and I see every day as a bonus day. My recovery has been remarkable! In fact, in 2015 I completed the 180 mile, 3 day Trek Across Maine bicycle ride across Maine with the American Lung Association to mark my third transplant anniversary. Tears flowed freely for both of us as I crossed the finish. We share a strong calling to make our world a better place by serving people trapped in poverty. We have been to Romania, Mexico, Guatemala and have served in a variety of locations here in the United States. After Hurricane Katrina devastated New Orleans, we were fortunate to help families reconstruct and rediscover hope on two separate group trips. In April of 2016 we will be traveling to Guatemala City to help an organization that rescues children from poverty better tell its story through its publications. Traveling with armed guards will be a new experience for us but we are committed to seeing children freed from life in the city dumps. Closer to home, we do all we can to help with Donate Life events promoting organ donation and volunteer to photograph Muscular Distrophy Association events and community events. With the digital revolution, “professional” photographers are now a dime a dozen. With a modest investment, a template website and a free Facebook page, thousands of people now call themselves “professional photographers” and charge for services even though they have had no training whatsoever. Most are uninsured, lack experience and don’t have the backup cameras, lenses and lighting equipment of true pros. It takes much more than a fancy camera to make great photos just like it takes more than a fancy brush to paint beautiful pictures. Wedding photography requires so much more than snapping pictures. True professionals capture excellent images, organize shoots, manage schedules and direct crowds to make sure they meet the goals of their clients. As members of Professional Photographers of America and the Maine Professional Photographers Association, our style is a combination of my (Scott’s) photojournalism background and art school training. We capture memories in stunning ways. That requires some photo-journalistic shots, some artsy, trendy shots and a careful mix when making photos that will be treasured for decades to come. We are photographers who uses a variety of tools and approaches to best produce the results you’ll treasure for years to come. Robin, as the second shooter, has developed solid photography skills while apprenticing with me over the years. She started out simply working as my assistant switching out batteries, changing lenses and setting up lighting but as she became more and more familiar with the flow of weddings, I put one of my backup cameras into her hands. She has become quite proficient over the years! As the lead photographer on our team, my formal training includes a photojournalism concentration as part of my Journalism degree from the University of Maine. After I completed my BA, I went on to study color photography and print making at the University of Southern Maine Art School. Since the tools and methods of photography are continuously evolving, I enroll in continuing education classes each winter studying new lighting techniques, advances in software and the newest trends and techniques in order to stay fresh. I am proficient with both Adobe Photoshop and Lightroom, edit with color calibrated high definition monitors and use only the best photo labs for product fulfillment. All images in our catalog are backed up locally and redundantly on two offsite servers to make sure we never lose an image. We are Nikon shooters and have a Nikon D800, D700 and D300 in our kit with lenses for most every imaginable scenario. We also have all the lighting needed for even the largest wedding receptions in dimly lit spaces. We have radio controlled Pocket Wizards to sync up to 12 flashes with diffusing umbrellas if needed. Chances are that you don’t really understand or care what all of these things are but your photographer should. Do you want just the files from your wedding photos? Robin and I refuse to be “shoot, dump and run” photographers even though that is what many brides believe they want today. Yes, numerous photographers will shoot your wedding, burn files onto a disk and head for their next gig. We can’t bring ourselves to do that to our clients. We’ve met too many brides who regret having made the decision to contract with shoot, dump and run photographers. Today, they have only a disk of photos and maybe a cheaply produced template photobook from a consumer-level company. Groupon special canvasses are already peeling if they ordered them at all. We value our clients too much and our art too much to play that game. It would mean much less work and greater profit. Who is more the more expensive photographer, the shoot, dump and run photographer who charges you $1200 for 8 hours and burns a CD or the photographer who charges you $2,400 for the same 8 hours and then spends another 40 hours working for you providing editing services, image balancing, custom design and an album and wall art you will treasure for the rest of your life? Our after-wedding services are just as important to us as the time we spend with you on your wedding day. We can’t imagine missing out on watching you open your albums or see your custom canvasses. We want to make sure you have a custom designed, gorgeous showpiece album that you will treasure for decades in addition to spectacular wall art canvas prints. We spend hours editing, balancing color and light, and looking at each image our brides choose for their albums and wall art. We use only the best quality canvas and the top professional labs to provide our clients with stunning results. It is our attention to detail and our determination to provide awesome results that has earned us recognition as being in the top 5% of professional photographers. Read our reviews to see what others have said about us and then make your choice. We would love the opportunity to work with you and capture your memories but if we’re not the right match for you, please choose a trained, insured, true professional who has the skills, equipment and experience to capture your memories in the best possible manner. Let your uncle, your best friend or your Mom’s friend with the nice camera enjoy your wedding as a guest. Your wedding memories are far too important to entrust to someone who is not equipped to give you the results you deserve. I recently read a story that told of professional photographers being extorted and held hostage by people threatening to post bad reviews all over the internet. Basically the deal is “pay us money or we will post terrible reviews and destroy you.” It can be effective because reviews are so important to all of us in the wedding photography business. Thankfully, so far, I have only received a couple negative reviews and in each I have no idea who the reviewer is and have never worked with them. We’ve been so encouraged by the reviews we’ve received. Once we hired Scott, his pre-game preparation was very impressive. Scott desired to really know Sarah and I so that he could capture our wedding the exact way we want to remember it. During the wedding, Scott did an excellent job of blending in with the guests. Yes, he was the only attendee moving around while taking pictures, but I felt that his work did not distract anyone from the ceremony. After the ceremony, it was time for family pictures — that long, tiresome process. Not at our wedding! Scott was very prepared, understanding what pictures needed to be taken and who needed to be in them. Everyone had a lot of fun during this time, and the pictures were outstanding! Scott then took our first pictures as Bride and Groom. Knowing our photographic tastes, Scott used various settings, poses, and camera techniques to create the greatest pictures we have together. Along with the wedding portraits, Scott showed off his artistic mind throughout the reception. We have pictures of our rings, our friends and family, our first dance, and so much more from an angle and lighting that you just don’t know how to ask for. Throughout our business with Scott, he presented himself and his work in a very professional manner; but with that professionalism also comes a sense of humor that helps you relax and feel the utmost comfort during this busy and stressful event. 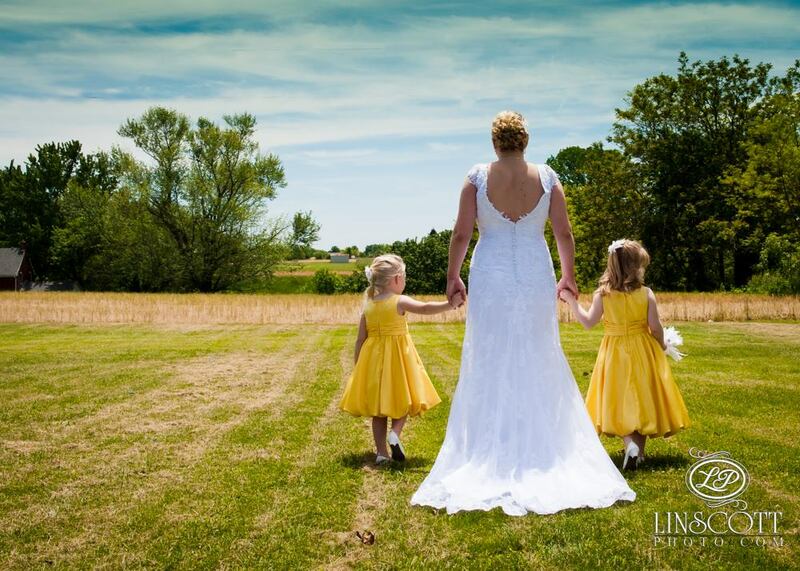 We were completely pleased with Linscott Photography and would highly recommend their services for your special event. Scott and his wife Robin make an outstanding team and exceeded our expectations as they captured our son’s wedding in photographs. Scott took the time to get to know my son and his bride before the wedding so he could incorporate their personalities into his photography. He had a great way of combining the information that we gave him about what we were looking for with his own creativity and knowledge as a photographer. Scott was so well prepared–he visited both venues before the wedding date so he came ready with great ideas for pictures. This made the wedding day photography well organized and go very smoothly. Another important thing to note is Scott and Robin’s wonderful personalities. They have a great way of relaxing everyone, making the photographs fun, as well as ensuring that all the photographs that you want are being taken. We all felt very confident that our son’s wedding pictures were going to be excellent because of Linscott Photography–and they are! The finished albums are really works of art–creatively arranged and well balanced. True family treasures. 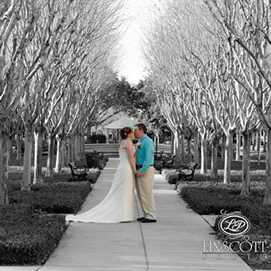 We will definitely be using Linscott Photography again in the future! ~ Sallie Gardner, mother of groom. Maine Wedding Photographers, Scott and Robin Linscott would love to share your day and capture your memories! Contact them at scott@linscottphoto.com or online at www.maineprophoto.com . Are you looking for a cheap wedding photographer who will simply give you the files? The call came just as I was working to blend a spot in some trees where I removed one of three power lines across a rich, blue sky. It was my final adjustment after about 90 minutes of working on this single image. I had already removed a tan line, cloned out a couple of people in the distance and did some of the usual work touching up the bride’s back in her dress. Ugh. It’s the question I hate. I hear it at least a time or two each week now. A lot of brides are looking to save money by cutting out the middle man in the photographic process. They want the DIY approach to wedding art thinking they can simply have the files printed themselves using Groupon deals and photo sales at Rite Aid and Costco. It’s so tempting to give them the deal they are looking for and simply shoot, dump and run. I tried it. It is impossible for me to be a shoot, dump and run photographer. I care too much about my images; my art. What brides don’t realize is that shoot, dump and run photographers actually make more money than photographers/artists who see shooting as only the first stage in their craft. The SD&R photographer may charge $1200-$1500 to shoot a wedding, which looks like a steal in today’s wedding photography market. They can make $150-$200 per hour after quickly culling through the images, deleting the failed shots and dumping the rest on a DVD or two for an anxious bride. The artist, however, will make maybe $30-$50 an hour, depending on their prices, because they are more concerned with the art they produce than they are with simply clicking the shutter. They poor their hearts into making their images the best they can be and will spend hour after hour making their images flawless. I’m sorry. I simply cannot shoot, dump and run. Really. Trust me, I’ve tried. I may be even more excited about the images I make than the brides and families are. Often times my wife and assistant, Robin, will drive us home from a shoot so that I can sit in the passenger seat to begin transferring images onto my laptop to see the result. Handing over my images without taking the time to raise and nurture them would be like giving up my babies. I’m serious. My last wedding was a destination shoot and I about died having to wait until after we flew home before I could see the images I created. Obsessive, right? I know. I am obsessive when it comes to my art. I simply can’t just dump them on a disk for you to throw into a box somewhere or get printed from a discount lab on low-quality canvas, cheap paper or poured into a template-driven book that is identical to thousands of other books. I can’t let you treat my babies that way. Strange? Actually, among my peers who are true, trained professionals (not the talented hobbyists who are pursuing their passion), I’m pretty normal. We take a tremendous amount of pride in having our work hang on your wall. We want it to be perfect. We live for the feeling that comes when you see your product and gush over our work. We love seeing you post on your Facebook page and we love watching your friends go crazy with comments. Last week the Fedex truck brought a 16×20 canvas. I quickly tore into the box it to inspect it. Wow. The color was great, the texture and depth were stunning but as I looked close I noticed a tiny spot in the sky. I used a cloth to see if it was just a small piece of dirt I could wipe away but it was part of the image. I showed 2 others and asked them “see if you can find the problem I have with this image.” As usual, neither could. Regardless, I called my lab, told them they had a piece of dust on a lens and they immediately reprinted and shipped me a perfect replacement. When I showed my client the old and new, she laughed and said she never would have noticed the tiny flaw. I noticed. I was not about to let my art hang on her wall with that little dust spot. Yes, it’s that important to me. My caller did her best to convince me to photograph her wedding and give her my images. She told me how much she loved my ability to produce both the traditional and the artistic and raved about my portfolio. It would have been a quick and easy Maine wedding paying $1800 for 8-10 hours of work. I am sure she would have been thrilled even with the stage one images I delivered but I sent her on her way. She was a little put out with me. That’s okay, I know she, like so many others, thinks that all we do is click the shutter. Her understanding is that our expensive cameras make stunning images that they could easily produce if they had the same equipment. Today I saw another new Facebook page advertising yet another new photographer pursuing her “love for photography” by charging money for portraits and weddings. I looked through a few of her albums of poorly-lit, oddly composed images and it made me sad. I wasn’t sad for her. She’ll learn. I was sad for the people she will learn on. She’ll gladly shoot your wedding and give you the images for just $1,000. I used to spend time trying to convince my SD&R callers not to go that route. I used to offer to meet with them to show them album samples and canvas wall art. I don’t do that anymore because I finally learned that they don’t value the art aspect to making photographs. Anyone can take photographs. Artists make photographs. Scott and Robin Linscott are Maine professional wedding and portrait photographers based in the Greater Portland area. Though most of their work is in the beautiful state of Maine, they have also worked as destination wedding photographers. Becca and Dustin – Celebration, Florida destination wedding February 2014. Do you need a Maine Wedding Photographer for summer 2014? Linscott Photography has a limited number of openings left for 2014 Summer and Fall and is booking 2015 weddings now. Why trust Linscott Photography with your Wedding? Confidence directing people & schedule. Capture both the trendy and traditional. The only thing that will remain after your wedding day is your photos. The cake and flowers will be gone, the DJ will be somewhere else and even the facility you used will be rented by someone else. The tuxes will be returned and your dress will hang in a bag. It will be your photographs that trigger the memories of the day. Your pictures will bring back the laughs and the music. Your photographs are more important than the cake, the meal, the music and the flowers. They are more important than the limo you rent for several hours and even the dress you wear that day. Our goal is to transport you back to your wedding day each time you view your photos. With top-quality Signature albums, professionally printed books, canvas art that will last for ages and prints made with the best inks and papers, we work hard to make sure your investment increases in value over time. They will become priceless. We show you complete wedding shoots not just a portfolio of our best photographs. Every photographer is able to provide a “best of” gallery but that is not always a good indicator of the overall quality of their work. We let you see complete proof galleries of some recent clients, without edits, so you will be confident in our quality. (see an example here). After you make your selections we go to work editing, retouching and applying effects to make your images phenomenal. Narrowing down your selections will be the challenge if we shoot your wedding because you will have plenty to choose from. Why hire true professionals? Is it worth it? As a member of Professional Photographers of America and Maine Professional Photographers Association, I would love being part of your day but, if not me, please don’t cut your budget by trimming the photography line item. Do you really want to trust your day to your uncle with the nice camera or that friend who “loves photography” and has shot a few weddings but has little experience directing people or accomplishing your goals on your tight schedule? Do you want your photographer friend to work your wedding or would you rather they enjoy it with you? Trust me, the day will come when you will wish you had hired a trained, experienced professional to capture your wedding. My wife Robin, a talented amateur photographer, usually shoots with me. (Some of Robin’s shots) We frequently hear from brides who are thrilled that they resisted the temptation to go with a cheaper photographer who would simply shoot and dump the files on a disk. Their choice for quality is affirmed every time they show off their Signature album or have a guest wowed by wedding wall art. By the way, the answer to Stephanie’s question? Can I rescue her wedding photos? Maybe. It depends how bad they are. Making bad images better is possible sometimes but the key to editing is to start with great images to make them breathtaking in retouching. Trained professionals start with great images and then improve them in editing. Others use Photoshop to make weaker images acceptable. Let’s get together to talk about your wedding. Let’s talk about your hopes and dreams for your wedding and get to know each other. You should always meet your photographer and make sure you connect well. Robin and I include a free engagement shoot with each of our packages. Why? Mostly so we can spend time with you, laugh together and enjoy connecting. Then, when your wedding day arrives you feel like a friend is joining in rather than someone you never met. Email me at scott@linscottphoto.com to get the ball rolling or visit us at http://www.maineprophoto.com to look around more. We love to hear from out clients!